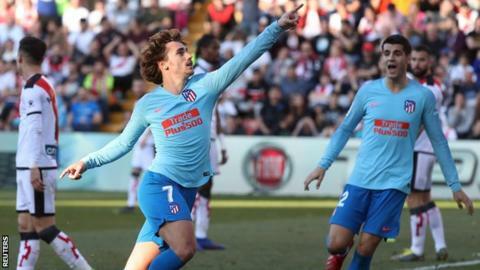 Atletico Madrid moved above city rivals Real into second place in La Liga after Antoine Griezmann's second-half goal saw off Rayo Vallecano. The only goal of the match came in the 74th minute when Alvaro Morata, on loan from Chelsea, set up the Frenchman, whose shot went in off Jordi Amat. It was Atletico's first win in three matches after defeats to Real Betis and Real Madrid earlier this month. Real Madrid will return to second if they beat Girona at home on Sunday. Atletico are next in action on Wednesday, when they entertain Italian champions Juventus in the first leg of their Champions League last-16 tie, before a home La Liga match against Villarreal on 24 February. Diego Simeone signed a new contract earlier this week to stay as Atletico's manager until 2022 and his side are seven points behind leaders Barcelona, who beat Real Valladolid 1-0 at home on Saturday.